Bitcoin, the world's most prolific virtual currency, has been rising in value and usage adoption, which could mean trouble for central banks. Bloomberg reports that bitcoin has more than doubled its value against the US dollar in the past year. As shown in the Bloomberg-compiled chart above, bitcoin's value has risen to $16.37 as of January 2013 from $5.88 in the previous year. It has since recovered from a record low of $2.14 sometime in November 2011 but still far off from its previous peak of $29.58 around June 2011. The data were compile from Mt. Gox, the world's largest bitcoin exchange that handled over 80% of all Bitcoin trade as of mid-2011. Bitcoin usage also seems to be gaining traction among users. Bloomberg said the number of companies using the services of Bitpay Inc., a bitcoin payment processing company, has increased almost 50% to more than 2,000 since November after WordPress started accepting the virtual currency. "PayPal alone blocks access from over 60 countries, and many credit card companies have similar restrictions," said WordPress to Slashgear.com on why the blog platform company began accepting bitcoin payments. "Whatever the reason, we don't think an individual blogger from Haiti, Ethiopia, or Kenya should have diminished access to the blogosphere because of payment issues they can't control. Our goal is to enable people, not block them." Bloomberg also reported that the greater demand for bitcoin and other virtual currencies has alarmed the European Central Bank (ECB) enough to warn against a possible "negative impact on the reputation of central banks" in an October 2012 report titled "Virtual Currency Schemes". The ECB report which is downloadable here acknowledges that virtual currency schemes are slowly creeping into the sphere of influence and functionalities of central banks, which should prompt central banks, in turn, to take a closer look at these schemes. "Virtual currency schemes have become relevant in several areas that traditionally fall within the scope of the financial system and especially so in relation to the tasks of central banks. Consequently, it seems appropriate to consider the extent to which they might affect a central bank's tasks in the areas of payment systems, regulation, financial stability, monetary policy and price stability," said the ECB. The ECB said that even if central banks do not have purview of virtual currencies, the public still could hold them accountable for any problems arising from the use of virtual currencies. "If the use of virtual currency schemes grows considerably, incidents which attract press coverage could have negative impacts on the reputations of central banks, if the public perceives the incidents as being caused, in part, by central banks not doing their jobs properly. As a consequence, this risk should be considered when assessing the overall risk situation of central banks." The ECB added that while virtual currencies may not pose risks to financial stability at the moment, "developments should be carefully monitored, as the situation could change substantially in the future." But Steve Hanke, a Jonhs Hopkins University professor who helped to establish new currency regimes in countries such as Argentina and Bulgaria, suggested that there is more than reputation at stake for the ECB as it faces the rise of virtual currencies. "I think the ECB obviously is concerned, and it's not reputational... I think it's a competitive threat. 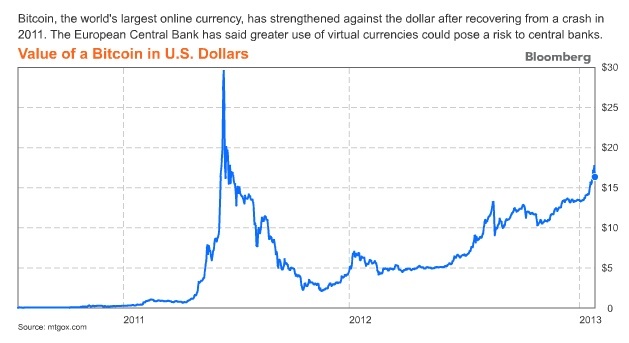 Maybe virtual currencies will be so convenient that they will pose a threat because of their ease of use."